How do Booster Bags work? DISCLAIMER: This article is intended for educational purposes only. The authors do not condone shoplifting, and any information contained in this blog post should not be used to engage in illegal activities. In fact, we encourage retailers and their agents to keep abreast of such shoplifting techniques, as this helps to inform them of how their loss prevention strategies may be circumvented. Put simply, a booster bag (sometimes called a ‘magic bag’) can be used to foil a store’s EAS (electronic article surveillance) detection system by blocking the RF or AM signal which is contained in a security tag or label. Essentially, the bag acts as a shield which prevents the tag from being detected by the security gate as it is passed. The bag is made of tin or aluminium foil, and this can be layered inside a shopping bag, backpack, or even the lining of a pocket inside a piece of clothing. Unlike opportunistic shoplifters, booster bags are used by professional thieves as an easier means of concealing multiple items in one visit. It also saves time for the would-be thief, as there is no need to remove security tags or labels inside the store. Most often, the shoplifter would use sleight-of-hand or a store blind spot to drop items into the bag. A more crude method involves wrapping ready-made layers of foil around an item at the time of lifting, and then sealing the foil with a fold. What items are needed to make a booster bag? Find a large, flat surface and lay out your tools. Fold the first edge of the roll about 5cm (2”) over, reflective side inwards. Roll-out some foil, reflective side up, and place one bag against the inside edge. The handle of the bag must not be covered by any foil (you’ll see why later). Also, the bottom part of the bag may be exposed for now, and this is OK.
Unroll some more length, and lay it over the top side of the bag. The new crease should be as close as possible to the edge – do not make it wider than the bag’s width because your outer bag will need to fit over it. Grab the two corners of the bag that are closest to the roll of foil, then lift the bag upwards, and as more foil unravels, flip the bag underneath so that the newest layer is on top. Press down the newly made edge so that it creases closely with the edge underneath. Repeat this process so that it makes four complete layers (remembering that each flip of the bag covers only one side – i.e. half a layer). When you have completed four layers (this is enough to block any signal from penetrating), tear off the last edge of foil, and use adhesive tape to seal it down. If the bottom part of your bag is still exposed (i.e. it’s longer than the width of foil), repeat the process above, but ensure that the bottom of the bag sits above the bottom lining of foil with about 5cm (2”) spare. 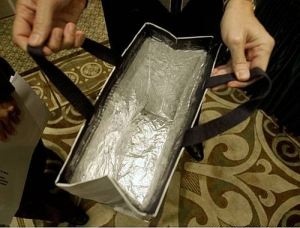 Next, at the base of your bag, fold the bottom edge of foil upwards, so that excess length is removed. Tape this bottom edge thoroughly so that it creates a nice seal. Your (rigid) bag now needs to rest inside an outer bag to conceal the foil lining. Carefully insert your foil bag so that it sits all the way inside the outer bag, right down to the bottom. Tip: You can gently unflatten the foil bag edges so that it puffs out slightly, making it easier to insert (a puffier looking bag is not undesirable, because it makes an empty bag look full). The bag must be pushed all the way down, so that the handles of both line up evenly. Fold the top of the outer bag outwards so that the inside bag’s handle is exposed. Apply double-sided adhesive tape near to the top edge and handle areas of the inside bag (on both sides), so that the outer bag can seal directly on top of it. Avoid placing tape on any of the foil. Unfold the outer bag and seal it down onto the tape. How do you test a booster bag? Place a cell phone inside the your booster bag. Pick up the bag by the handles, and hold it naturally, as you would in a store. Call the cell phone from another line. If it doesn’t ring, your bag is secure. If it did, you may need more layers, or check that the top of your bag has been sealed down thoroughly.